We all love a great customer service story. Learn from iconic brands from around the world as we share some of the best customer service stories that demonstrate truly remarkable customer experiences that go above and beyond the call of duty. 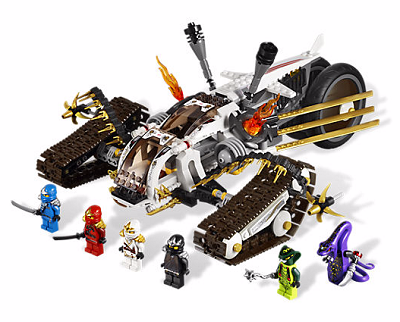 Seven year old, Luka Apps, loves LEGO and spent all his Christmas money on the Ninjago Ultrasonic Raider set. Luka lost his Jay ZX mini-figure at the supermarket, after his father’s advice to leave it at home. Luka was so upset about losing his LEGO figure that we decided to a letter to LEGO customer service to ask if he could get a replacement. Luka, I told Sensei Wu that losing your Jay minifigure was purely an accident and that you would never ever ever let it happen ever again. he told me to tell you, “Luka, your father seems like a very wise man. You must always protect your Ninjago minifigures like the dragons protect the Weapons of Spinjitzu!” Sensei Wu also told me it was okay if I sent you a new Jay and told me it would be okay if I included something extra for you because anyone that saves their Christmas money to buy the Ultrasonic Raider must be a really big Ninjago fan. 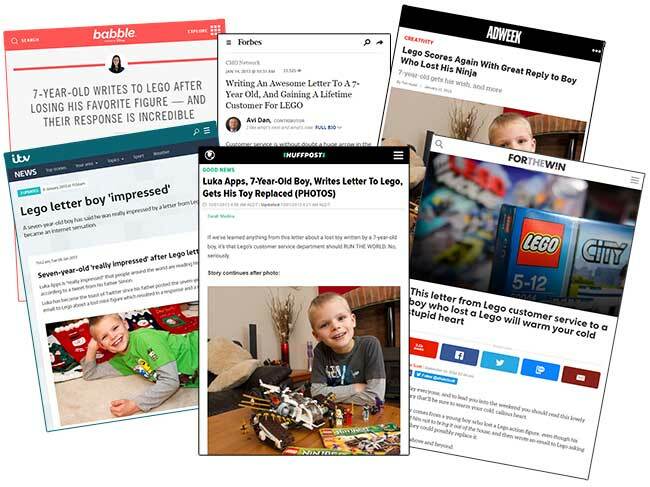 In a world of social media, LEGO’s response and action to go above and beyond to please a little boy has done wonders for their brand, with Luka’s dad tweeting LEGO’s response and the story going viral and getting picked up by mainstream media. @rjball87 We were all really impressed with the reply from Richard at @lego_group. He definitely deserves a pat on the back. Not only did LEGO make Luka’s day, but has earned the toy manufacturer abundant praise and publicity with a multitude of customers responding to the story, and sharing similar customer experiences and compliments to the customer service team at LEGO. As a result, millions of potential customers have read Luka’s story and can take comfort in purchasing from a brand that cares for its customers. @Arlee82 going out to buy $100 in Legos now just because I want to vote with my wallet for that level of customer care. At LEGO Everything is Awesome, but most of all, their customer service is exceptionally awesome. When a Tesla owner, Loic Le Meur, complained to Tesla CEO, Elon Musk, on Twitter about fellow consumers hogging spots at a local charging station, Musk took the feedback seriously. Within minutes, Elon Musk responded and promised to take action. Just six days later, Tesla announced a new policy where Tesla owners would be charged if they left their cars after they finished charging. Tesla pushed a software update to their entire fleet, in response to customer feedback. With all the responsibility that comes with being CEO of Tesla and SpaceX, Elon Musk listened to a customer, offered a personal response, committed to action and executed a solution within just six days. Now that’s customer service. At incredible speed, Musk resolved a customer complaint and provided a result aimed at improving customer happiness for all Tesla users and making the supercharging experience better for everyone. It’s no surprise that Tesla is the number one car brand ranked by customer satisfaction. Elon Musk proves that it’s possible to take customer complaints, as well as humans, farther from Earth than ever before. Christina McMenemy is a regular customer of the Gaylord Opryland resort that stayed at the hotel regularly for the annual BlissDom conference. On Christina’s stay, she fell in love with the soothing sound played by the alarm clock radio in her room, titled ‘spa’, that transformed her into a blissful state of relaxation and gave her a peaceful night sleep. Christina found the music so relaxing, that she noted the model number of the alarm clock prior to leaving the resort to purchase her own. On her third year of staying at the Gaylord Opryland for the BlissDom conference and craving a clock radio of her own, Christina remained unable to find one and sent a tweet to the resort for assistance. 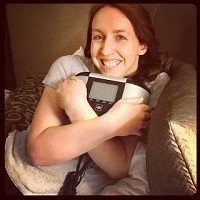 The Gaylord Opryland resort replied indicating that the model of the alarm clock in the hotel rooms was made only for the hotel and wasn’t available to the public, but an alternative version was available. Unfortunately for Christina, that alarm clock didn’t include the ‘spa’ music that she had her heart set on and responded again to Gaylord Opryland. 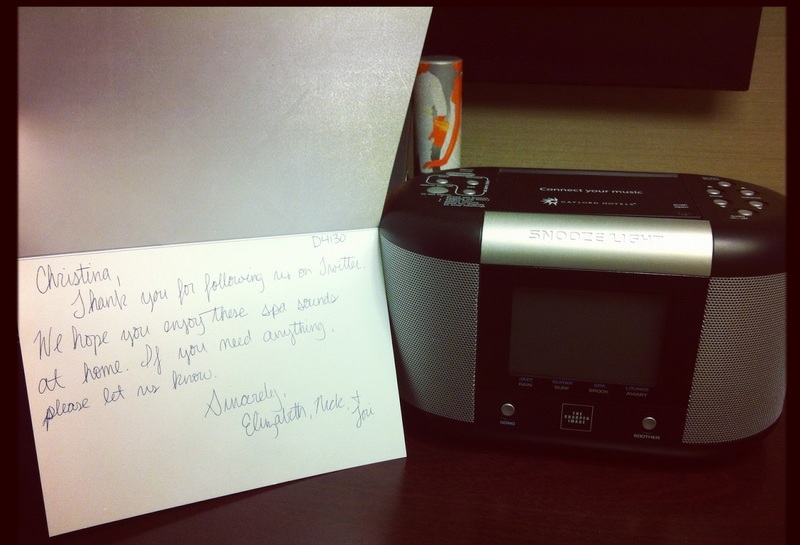 On returning to her room after the Blissdom closing night party, to Christina’s surprise she found two clock radios on her dresser with a handwritten card. Thank you for following us on Twitter. We hope you enjoy these spa sounds at home. If you need anything, please let us know. Gaylord Opryland recognised the opportunity in ensuring a loyal and long-time customer had the most memorable experience at their resort. And not only did they win a customer for life, but have earned brand recognition and publicity from other Blissdom conference attendees through word of mouth and attention from the story. Three-year old, Lily Robinson, was puzzled by Sainsbury’s tiger bread. In little Lily’s eyes, the tiger bread didn’t resemble a tiger at all, but it looked more like a giraffe. Lily’s curiosity led her to write a letter to Sainsbury’s. 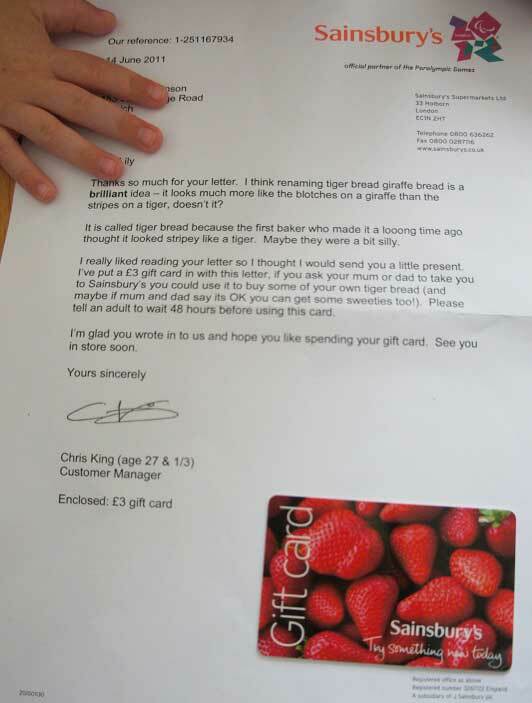 To Lily’s surprise, Sainsbury’s responded with a letter explaining the origins of tiger bread and enclosed a £3 gift card of Lily. “Thanks so much for your letter. I think renaming tiger bread giraffe bread is a brilliant idea – it looks much more like the blotches on a giraffe than the stripes on a tiger, doesn’t it? 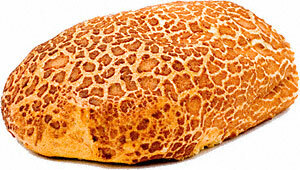 It is called tiger bread because the first baker who made it a long time ago thought it looked stripey like a tiger. Maybe they were a bit silly. Lily’s mother posted the letters on her blog and before long the cute correspondence and the topic of tiger bread gained a lot of attention on social media. 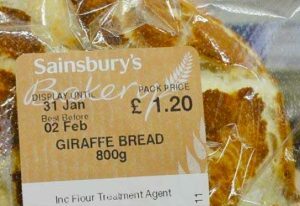 So much so, that Sainsbury’s has now given in to popular demand and renamed their tiger bread to giraffe bread. 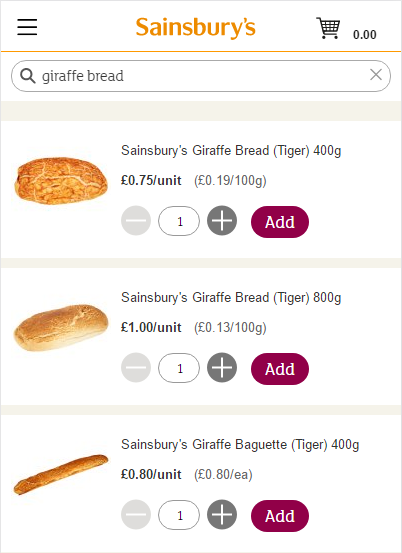 Despite the fun and light-hearted contents of Lily’s customer feedback, Sainsbury’s listened to her suggestion and responded by taking subsequent action to change the name of the product from tiger bread to giraffe bread. The supermarket understood that the customer was right in this instance and Sainsbury’s actions have proved their strong commitment to customer service. 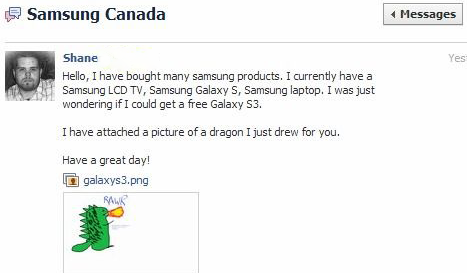 Shane Bennet sent a message to Samsung Canada on Facebook, cheekily requesting a free Galaxy S3 phone and attached a drawing of a dragon with his message. 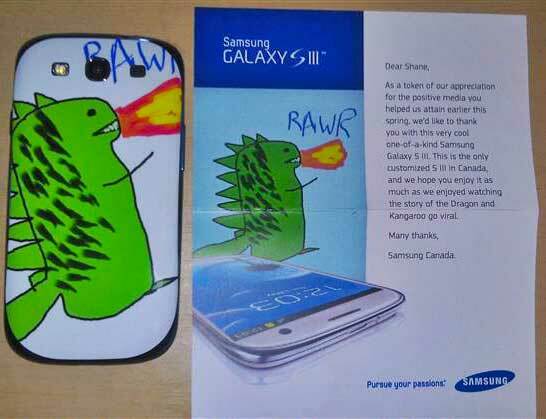 Entertained at Shane’s request and drawing, Samsung responded with equal candor. Samsung declined Shane’s request, suggesting that if they gave free phones to everyone that asked for one, the company would go broke. The response from Samsung wasn’t completely hollow, but included a drawing of a kangaroo on a unicycle for Shane’s enjoyment. Amused by Samsung’s reply, Shane took to Reddit and posted a photo of the exchange with a caption, “Well, Samsung Canada has won me over again”. The screenshot was quickly voted up onto Reddit’s front page and went viral on social media networks. Samsung Canada kept in touch with Shane Bennet, inviting him to a launch party. Months later, Shane received a new free phone from Samsung Canada. And not just a Galaxy S III, but one made especially for him. 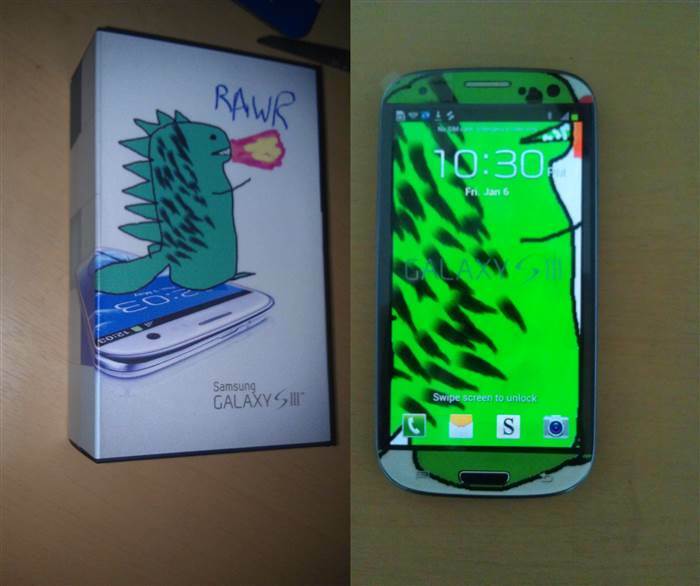 The phone was custom made and decorated with Shane’s dragon drawing. Even the packaging was custom printed with the dragon drawing. Every customer interaction can be transformed into a win. Samsung demonstrated that you can offer personal service and make a great impression, even when refusing a customer request. Samsung’s response created a customer experience that Shane wanted to share with the world. Happy, satisfied customers have the potential to be brand champions that are so delighted by the experience you deliver, that they too promote and bring new customers to you by singing the praises of your brand. Helloify is a sophisticated, yet simple live chat service that lets you communicate with web site visitors and increase sales on your web site. Add it to your site now.